Zebra cards give you image sharpness needed for vivid colors and detailed, readable bar codes. Poor quality cards often have uneven surfaces and burrs that reduce print quality and cause printhead damage. Zebra guarantees its pure PVC and Composite PVC cards to be compliant with ISO standards, dust-free, and have smooth edges, giving you better print quality every time. For more demanding security applications, make your cards more tamper resistant and secure with Zebra's custom embedded holograms, color shifting ink, opacity marks, pre-printed microtext or UV images, and custom designed cards. All these card options are available from your Zebra reseller. Embedded Hologram Cards PVC & PVC Composite cards with a tamper-resistant hologram embedded within the layers of the card for an added low-cost security feature. The hologram is part of the background of the white card enabling printing to be applied directly on top of the hologram. Lamination may also be applied if required. The hologram incorporates both visible and ultraviolet printing of a pattern or logo. This security feature prevents the hologram image from being reproduced with photography or photocopying. 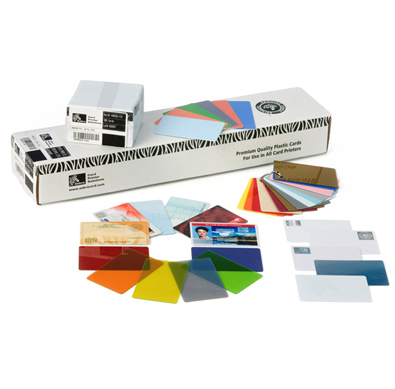 Color Shifting Ink Cards PVC & PVC Composite cards with a specified image of colorshifting inks formulated to change from one color to another. This feature is part of the inner layer of the card and cannot be scratched, or removed. Opacity Mark Cards PVC cards with a tamper-resistant printed image within the layers of the card for an added low-cost security feature. Image acts as a watermark, only visible when held directly in front of a bright light source. The image can be of any color or image. This security feature prevents the image from being reproduced with photography or photocopying. Micro Text or Nano Text Cards PVC & PVC Composite cards with pre-printed text that can only be read with magnification or with UV exposure. This security feature is very hard to duplicate or photo copy. Customizable Security Cards Cards with customized security features are available by special order. Contact your local authorized Zebra reseller for more information. Other Card Accessories Hand held card punch tool that slots cards and lapel clips to attach cards to clothing.